A deadbolt is a physical security standard for protecting exterior doors. When selecting a deadbolt to protect your business, there are several factors that you should consider. The first reason is a concern for life safety. A double cylinder deadbolt may prevent you from exiting quickly in case of emergency. You don't want to be fumbling for a key when your building is burning. Some manufacturers do make a "captive thumb turn" key - basically, a removable thumb turn that transforms the lock from a single to a double cylinder. But the fact that the thumb-turn can be removed means that it may not be handy when you need it. The second reason to reconsider this policy is the strength of modern windows. Back when single-pane glass was the norm, the single cylinder deadbolt was a bigger risk. The glass on most newer doors is nowhere near as flimsy. Our recommendation is that you use a single cylinder, Grade 1 Deadbolts on all your exterior doors. If possible, use solid doors with no glass. Underwriters Laboratories is another well-known organization that tests products and writes standards. 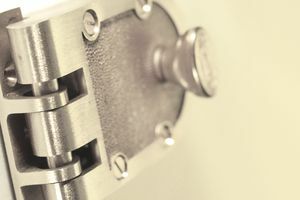 UL 437 is the standard for high-security locks accepted across the security industry. In order to pass the UL 437 test, locks must resist a variety of attacks including drilling, picking, prying, etc. The "strike" is the metal plate the attaches to your door jamb and receives the bolt. This should be installed using 3-inch screws. Using long screws secures the strike to the door frame, not just the jamb. In addition, your lock should also have a reinforced strike plate with offset screw holes. The off-set holes ensure that the screws aren't driven into the same grain of the wood. When someone is trying to kick in your door, the jamb will normally give way before the deadbolt; but the extra long screws and reinforced plates will stand up to some serious pounding.